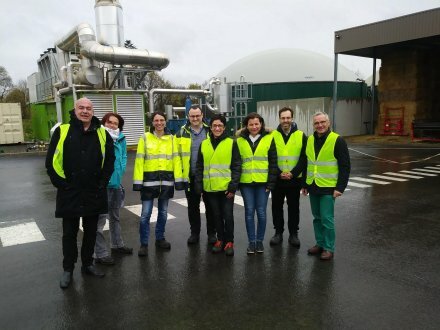 The Air-Noise-Smell GT of Bretagne-Eco-Entreprises, led by Pascale Corroyer of the ODOURNET group, organized on Friday, April 5, 2019, the visit of an anaerobic digestion site. This working group works in permanent link with the FIMEA association, its vocation is to create a place of exchanges on the topics of Metrology and Solutions in Indoor Air Quality, Outdoor Air Quality, Ventilation , Noise and Vibration and Odor Expertise. It is the VOL-V group, whose environmental aspect plays an important role in the design and operation of its anaerobic digestion sites, which opened the doors of its Montauban-de-Bretagne operation (35). The visit of the site enabled the actors to get to know the VOL-V Group’s business in the design, development and operation of renewable energy production sites (biogas production, for the VOL-V Biomass branch). The Montauban-de-Bretagne site, in operation since the end of 2017, is sized to recover up to 36,000 tonnes of organic by-products per year – ie: a maximum capacity for introduction into the digestion process at the site of 98 tons per day. It is essentially slurry, manure, vegetable waste, by-products from agri-food activities – overall, in the proportions of: 70% of substrates of agricultural origin and 25% of agro-industrial origin, the balance being from collective / restoration establishments, … In Montauban-de-Bretagne, the biogas produced feeds a so-called ‘co-generation’ engine, with an installed capacity of 1.2 MW, generating electricity + electricity. heat used locally. The digestate resulting from the process, with high agronomic value, is valued on nearby cultivated land, as a partial substitution for imported mineral fertilizers. At the heart of the circular economy, this unit consolidates the economic and social fabric. We would like to thank ALHYANGE Acoustique, MANUMESURE, RUBIX, ECOGAS (BEE Distribution solutions), PAPREC and of course Vol-V for their welcome and availability!